I have a friend who has had acid reflux, heartburn, and general stomach pain for more than 25 years. With the added stress from a new job, a loss in the family and a difficult winter, his stomach was acting up daily and taking a serious toll on his health. His prescribed antacid routine helps his symptoms, but it doesn’t heal his stomach. In fact it has made the problem progressively worse. In January I sent my friend some marshmallow root. I gave him directions on how to use it to its maximum potency and he called me just last week and told me that he can feel it healing his stomach. I’m really excited to hear that news, of course, but I’ll tell you the same thing I told him: this isn’t a fast fix. Acid reflux is a bear of an illness to live with and to work with. It’s painful, it comes on fast, and the typical allopathic fix for the pain exacerbates the actual problem. The very best way to combat acid reflux is to have a real understanding of you’re working with. Acid reflux, also known as GERD, is caused when digestive acid produced by the stomach moves into the esophagus. Stomach acid has a pH in the same vicinity of concentrated sulfuric acid, lemon juice and vinegar (around 1.5 for your chemistry lovers) and your esophagus is a thin tube of unprotected mucous membranes and soft tissue. You see where I’m going right? If the stomach acid gets up into the esophagus even once, you’re hurting. If it happens over and over again, your body doesn’t have a chance to heal the irritation and it can become a really serious problem. I think it’s important to note here that the common cause for acid reflux is having too little acid in the stomach. Yes, I wrote it and I checked it twice. Acid reflux is often caused by too little acid in the stomach. The lower esophageal sphincter (LES) is a valve that allows food to pass through it into the stomach. It opens when the stomach is empty and your body is ready to accept food and it closes when your stomach starts digesting food so that the stomach acid doesn’t seep up into the esophagus. But Aubrey, doesn’t that mean that there’s too much acid in the stomach? The human body is an amazing thing and the production of digestive juices is really important. Starting with the mouth, chemicals released throughout your body by your digestive process let your LES know when to open and close. If you’re low on digestive juices, your food is going to sit in your stomach and digest too slowly, which creates gas and puts pressure on your LES, which can open just a tiny bit to relieve the pressure (or maybe never got the signal to close) and the stomach acid goes “BLAM! I got you, esophagus!” Even a tiny bit of stomach acid in your esophagus can cause major pain. If you have enough digestive juices, your stomach can digest things quickly so that they don’t putrefy in your stomach and your body can normalize the intra-abdominal pressure. Additionally, the chemicals that are secreted by your stomach and your brain when you’re eating will let your LES know when to open and close in a healthy way. Now do you see why I mentioned that antacids are actually making things worse for people suffering with acid-reflux? They decrease the amount of acid in the stomach, effectively forcing your stomach to work a whole lot harder to digest your food and they confuse your LES muscle by not allowing for the natural signal for it to close when your stomach is digesting food. We talked about the importance of gut health and the bitter herbs that stimulate digestion, but if you suffer from acid-reflux or chronic indigestion, it’s important to start slowly with your healing process so that you don’t overload your system. If your LES isn’t closing properly on a consistent basis, it gets used to working that way. If you add bitters to your routine right away to increase your digestive secretions you could be in a world of hurt. I’m talking severe ouch. That’s where marshmallow root comes in! Marshmallow is demulcent, emollient, and anti-inflammatory – that’s herbal speak for, “it’s juicy, smoothing, and soothing.” It’s made up of 10-30% mucilage, which means it’s really gooey when prepared with water, and that mucilage coats the esophagus and the stomach. This mucilaginous coating effectively protects the LES and esophagus from the stomach acid, so if acid gets up into your esophagus it won’t irritate the smooth muscle. After your insides are all good and coated, marshmallow’s emollient and anti-inflammatory actions go to work soothing your irritated smooth muscle and mucous membranes, giving them some nourishing love, and the chance to heal naturally! Obviously, this isn’t a one time deal. You can uses marshmallow root for acid reflux pain in your stomach or esophagus, but in order for your body to actually heal itself from this painful disease, you will need to take the marshmallow infusion pretty consistently. A suspended cold infusion of the marshmallow root will pull the most mucilages out of it that you can get. The cold infusion takes a few hours, so if you’re in a pinch, a regular hot tea infusion or mixing a teaspoon of the powdered root in a cup of water works really well for a stomach ache. Ratio for infusion: 1 Tablespoon of herb to 1 Cup water. You may want to make quite a bit of this at one time to save yourself time and energy so extrapolate this recipe as needed. Pour room temperature water over the herb, making sure that your suspended herb is covered. Let sit for at least 4 hours, 8 hours or overnight is better. Drink 1 cup first thing when you wake up, another halfway through the day, and a third before bed everyday. Depending on the severity of your acid-reflux and the damage done in your esophagus and to your LES, you may have to continue this measure for some time before you see a marked difference – you may also see an immediate difference like my friend. Remember, bodies work in amazing ways! This is just step one on your healing journey so work with your herbalist on your next steps to optimal gut health. They may have you add herbs to your cold infusion (chamomile is an amazing herb to steep cold with your marshmallow) or move you to a neutralizing cordial to help add some bitters to your routine without the serious pain. We focused a lot on acid reflux in this article because it’s such a prevalent disease in our cultural and it’s totally treatable with some simple herbal remedies and self care. But marshmallow is great for a lot of other things too! The same mucilages that coat your throat don’t break down in the body until they reach your colon, so marshmallow root is an awesome way to treat all sorts of irritation or inflammation all throughout your digestive system. 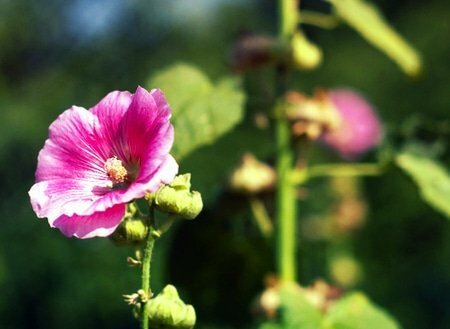 Everything from a simple sore throat to Crohn’s to ulcerative colitis can get relief with regular use of marshmallow root. You can gargle with it for inflammation or ulceration in your mouth and you can use it with a dry cough. It makes a great lubricant and in ancient times was used for impotency and as an aphrodisiac. It’s safe for kiddos and during pregnancy and yes, you can make real marshmallows with it! The only times you’ll want to avoid marshmallow root is if you’re having a lot of mucosal congestion or if you’re on some important medications. It’s so juicy that it can interfere with the absorption of pharmaceuticals so give yourself a few hours between drinking your marshmallow infusion and taking your meds. So go get yourself some marshmallow root, experiment with it, and let us know how it makes you feel in the comments below! Beyerl, P. (1984). The master book of herbalism. Custer, Wash.: Phoenix Pub. Just one more question; I have also chronic sinusitis. Should I avoid this herb? Hi, I am so glad to have found this article on Marshmallow Root for treating GERD. I have been on PPI’s on & off for 4 years now. I purchased a bag of raw Marshmallow Root (which looks like wood chips) and it is so soothing for me. It helped me tremendously to come off of the ppi’s. I steep the marshmallow root overnight to drink the following morning. But its very watery and in no way thick. Am I doing something wrong?? I also thought that maybe when its ingested it gets thicker?? Thanks for your help!! I have a big problem with reflux but also constipation. When I tried Slippery Elm for the reflux it increased constipation problems. Will this also occur with Marshmallow. Can I take extract instead? I prepare my marshmallow quite differently but I must say it’s very effective. I have GERD and when I get an attack, it gives me a sore throat. Three days of consecutive use: the sore throat was completely gone. I use one capsule and dilute it in a cup of water. Works like a charm. Is it a teaspoon for the hot prep and a tablespoon for the cold? or was that a typo? Thanks for the advice Aubrey. I’ve suffered quite badly with a cough since 2004, which I am now realising is mainly caused by acid. I will keep you posted. I recently started taking the herbs, mullein, hyssop, and plantain. Which have been beneficial. Peter. Hi, I purchased some dried cut marshmallow root, and made tea from it, but it didn’t turn how I expected. It was though I’d put some wood chippings in water for a few hours. Tasted like that too. I thought it would be something of a thicker constiuency. Is it supposed to be the constiuency of ordinary tea. ? Cheers. Peter. I use the super thin powder, it mixes wonderfully! … And I also add a bit of slippery elm. Its super thick, but has made major changes in my home! I used marshmallow root recently after 2 months of stomach hell – tightening throat, burning, feeling nausea on an almost daily basis after I’d taken a course of antibiotics unwisely on an empty stomach. I infuse it in tea with passion flower and camomile. After a few uses nightly the dry cough I had is all but gone and my symptoms are far less severe or frequent. I bought it in herb form and it was only £2 from my local health shop. It’s so tasty an soothing in tea, too. Thanks for the tips! Do you think Marshmallow root tablet (dried powder form) is also effective? I really like your explanation of GERD. It makes sense to me that anything that would reduce stomach acid would only exacerbate the GERD (lower acid= more resident time for food in the stomach=more gas/bloating = leaking of stomach acid into esophagus). I have been suffering from GERD (or gerd like symptoms) for the past few months. I am going to try Marshmallow root. Thanks for the wonderful article. I really like your explanation of the GERD. It makes sense to me that anything that would reduce stomach acid would only exacerbate the GERD (lower acid= more resident time for food in the stomach=more gas/bloating = leaking of stomach acid into esophagus). I have been suffering from GERD (or gerd like symptoms) for the past few months. I am going to try Marshmallow root. Thanks for the wonderful article. I have a very disabled daughter with severe feed. She is on anti convulsants. Is marshmallow safe to take? I’m not sure. Most likely it would be fine because marshmallow is very gentle, but I would suggest talking to a holistic practitioner about working with Marshmallow along with the medication your daughter is on. Hi. Was wondering where can one purchase marshmallow Root? Can you tell me a website where I can purchase it? Thank you. Your local herb store should have it or you can order it online from Mountain Rose Herbs! Can one use the tincture/liquid alcohol free instead of the herb to get relief? The tincture might be okay, but it won’t have quite the same demulcent properties. I would suggest working with the tea or the powder if you can. I work at a health food store and have customers that don’t like to use bulk herbs even though we sell them. What’s your opinion on marshmallow in the capsule form? I personally don’t recommend the capsules of marshmallow root, especially if you’re using it for the acid reflux, because the stomach acid has to break down those capsules and the marshmallow root is less effective in the upper GI tract. Many people use the capsules for lower GI issues like leaky gut and that’s a bit better because the capsule is typically broken down already but since marshmallow root is healing to all of the internal mucosa, I think it’s always better to use just the herb if possible. Not to mention that when you’re purchasing a pre-made capsule, there’s always a chance that you’re not getting the highest quality herbal ingredients (depending on the company). For people that don’t want the hassle of making the tea, I often recommend working directly with a teaspoon of the powder and adding it to their morning routine in a cup or water or mixed in with their breakfast. do you think is safe for babies with GERD? We’re not qualified to speak on that, but thank you for reading and commenting! I have realy bad refulx, ave had a funduplaction wrap. Ave got heartburn back again with avengence, ave have found out that my wrap has slipped. Can this be repaired. Thank you. We’re sorry to hear that. Because it sounds like you’re experiencing serious discomfort, we do suggest visiting with your doctor and working with a holistic practitioner.